The first season has been touted as one of the best Marvel Netflix shows after Daredevil’s Season 1… and maybe Season 2, depending on who you ask. Jessica Jones’ Season 1 set the bar pretty high for itself, but if Daredevil could come out with a compelling second season, then so could Jessica Jones, right? So, what happened? Why is Jessica Jones’ Season 2 only better than Iron Fist and maybe The Defenders? By the way, for the record, I would list the Marvel Netflix shows, from best to worst, as follows: Daredevil Season 1, Daredevil Season 2, Jessica Jones Season 1, The Punisher, Luke Cage Season 1, The Defenders, Jessica Jones Season 2 and Iron Fist. 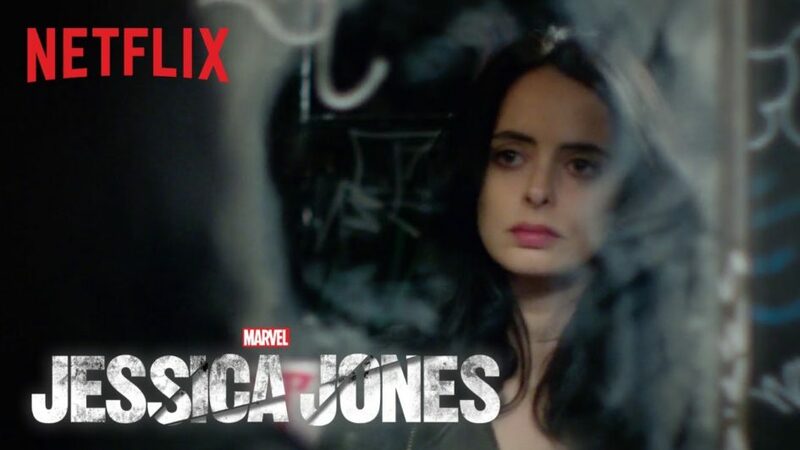 Why do I rank Season 2 of Jessica Jones so low? Well, for a superhero TV show, there’s no great super-villain like Kilgrave in Season 1 — played by the immensely talented David Tennant (the Ninth Doctor on Doctor Who), who only shows up as an hallucination in episode 11 of Season 2. There’s also no real antagonist and the first all-too-brief, fight doesn’t happen until about the end of the third episode. Three hours is a lot to ask an audience to sit through. Of course, this could have been avoided if the show used the villain, Will Simpson/Nuke, who they set up during the first season. Lack of villain aside, the show wouldn’t be so bad if the titular hero was solving mysteries and doing cool detective work. After all, Jessica Jones runs the business, Alias Investigations. However, there’s not much investigating going on. There are a few cases at the beginning, but it mostly involves following people around and taking pictures. If detective work were that easy, more of us would become private investigators. As someone who grew up watching Murder, She Wrote with my grandpa and now watching Miss Fisher’s Murder Mysteries with my mom, I think this show missed a grand opportunity. At the very least, instead of turning potential clients away, they should have had Jessica Jones do what Benedict Cumberbatch does on Sherlock, where he gives prospective clients rapid-fire answers to their mysteries, based on logical conclusions, before turning them away. This season’s mystery is Jessica Jones investigating IGH — the organization that gave her powers. At the beginning, it’s her friend, Trish, who’s doing all the initial investigating and her associate, Malcolm, who encourages Jessica to investigate. But at first, Jessica doesn’t want to investigate or care about IGH, and if she doesn’t care, why should the audience? Personally, I don’t care much for a bunch of flashbacks and origin stories. After all, it’s not how a hero gets their powers, it’s how they choose to use them. Luke Cage Season 1 did it right where they showed just enough of a flashback to make it relevant to the rest of the plot. It also gave us an image of his classic look, to the delight of fans. There’s not much to IGH either, unfortunately. Certainly not enough to warrant 13 episodes of viewing. The plot was too thin for an entire season. The pacing of this season is terribly slow. It doesn’t help that the editing is poor, lingering too long during some takes in an effort to fill time. Most reviewers have written that they feel that it doesn’t really pick up until the seventh episode. If this is a common consensus, why not start the show where it gets interesting? What I’m trying to say is, there’s not enough action. Defenders of Jessica Jones’ Season 2 might point to the merits of in-depth character development or the personal journeys of the core characters in place of fights and action. But as someone who grew up watching Buffy The Vampire Slayer and Xena: Warrior Princess, I know that I can have BOTH in a TV show. Speaking of Xena, writer Liz Friedman, who worked on Xena, also was on board for Season 1 of Jessica Jones — which might explain why the first season had more action. Although, she was replaced by Raelle Tucker, who worked on Supernatural and True Blood, those shows had some action… although not as much. Anyway, if Netflix is married to the idea of all its Marvel shows receiving 13 episodes, then why not give Season 2 of Jessica Jones two story arcs within the season? Season 2 of Daredevil was able to do this effectively with the phenomenal Punisher arch during the first half and the adequate Elektra arc during the second half. The Punisher story was so powerful that it spawned an entirely new series for the character. There’s no reason that Season 2 of Jessica Jones couldn’t have done the same during its first half. The closest we might have gotten was with the Easter egg appearance of the character, The Whizzer. Alas, his time on the show was too short. New York City has a treasure trove of heroes. The Whizzer and Jessica Jones make two different Spider-Man references, and while I don’t expect the wall-crawler to make an appearance, I see no reason why more Marvel characters couldn’t have been introduced. Off the top of my head, I’d suggest lawyer Jennifer Walters/She-Hulk, millionaire/former mercenary Marc Spector/Moon Knight, Angela del Toro/White Tiger or Maya Lopez/Echo. I had to break out my Marvel Knights trading cards from the VS System game for those last two characters. Carrie-Anne Moss, who plays lawyer Jeri Hogarth in Season 1 of Jessica Jones and has quite the story arc in Season 2, played an important role when she showed up in Iron Fist. Jessica Jones’ Season 2 could have introduced characters that would become future members of Heroes for Hire. Aside from the aforementioned White Tiger, some characters I’d suggest might be: Silver Sable, Tarantula IV and Paladin. Colleen Wing and Misty Knight have already been introduced in Iron Fist and Luke Cage. As for potential villains, I already listed a bunch in my article on The Defenders. There were so many missed opportunities for Season 2 of Jessica Jones. While there is character exploration, there’s not enough action or enough mystery to keep the audience hooked. Season 2 of Jessica Jones is only for the die-hard fans of the characters. Casual viewers, and even some fans of the first season, will give up during the first few slow-paced hours and look for something else on Netflix under the Marvel banner.